And so, just like the DX Fourze Driver from years ago, the DX Ghost Driver from the Kamen Rider Ghost role-play series has snagged this year's Hit Sales Award at this year's Japan Toy Awards. 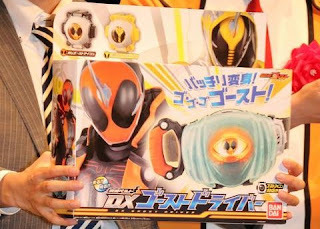 The award was presented to the toy that had huge sales during the Japanese fiscal year. So what are you waiting for, get your very own DX Ghost Driver by visiting our advertisers! "This statement *shows that I don't hate Kamen Rider Ghost..."
I think your username would suggest otherwise. Nice toys, bad story. See, Toei doesn't care about fricking storyline as long as they got some rupee on the pot. Ghost has a good story and anybody who thinks otherwise must like that Kamen Rider series called, "Kamen Rider Dragon Knight"! @God Zillia: Okay obvious troll. We know you just want to make people salty by saying that. You know that guy is a troll do you? Wow someone's made a fake account using my username and spread hate about me being a troll. Should I proud or what? I've been in Jefusion like since 2010 and this guy showed up and make me the "villain"? God must be crazy. Pls respond bout this issue Admin. Why are people wasting their valuable lifespan responding to a troll, who is delighted that people are wasting their life responding to them, when they could do something else more productive?